Rain, Rain Go Away...Get to Shop Another Day! In a tropical country like the Philippines, expect rainy weather more than half the time. We have grown so accustomed to rains and floods that we can afford to go about our daily lives as if rains do not exist. However, rainy weather has been known to dampen people’s moods, especially if it has been going on for days on end. To cheer you up, Zalora PH has come up with what it calls its Rainy Day Deals, a special discount given to all shoppers when the weather is really uncooperative. Imagine being able to shop from the comfort of your own home while stormy weather is turning the streets into virtual oceans. You don’t need to step out into the flood just to get your shopping fix - you can do everything online. Shopping at Zalora is safe and convenient, what’s more it saves you a lot of time and energy. When the rains are bad, the last thing we ever want to do is head out and brave through traffic and floods. Shopping online is a good way to while away the time and not get bored because you were unable to go to work or school. The great thing about the Zalora Rainy Day Special sale is you get to choose from any of the current items that are being offered. 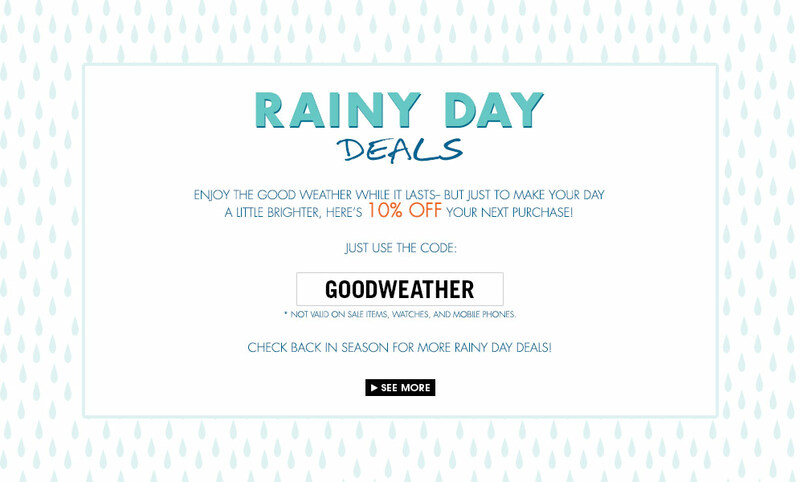 You only need to enter a special code; GOODWEATHER before completing the payment process and you will automatically be given 10 percent off on all your purchases. The only restrictions are items that are already on sale, watches and mobile phones. However, the rest of the items that you buy will be discounted. Online Shopping Made Easy at Zalora! Enjoy the convenience and comfort of shopping from home or work via Zalora PH. You can shop to your heart’s content rain or shine!